The imbalance between the direct and indirect pathways of the striatum is involved in psychiatric disorders such as autism. The inwardly rectifying K+ (Kir) channel could fine tune the balance between these two striatal pathways, which suggested that the pharmacological modulation of the Kir channel may be useful for research of striatal-related function and disease. The K+ leak channel is involved in determining resting membrane potential and excitability with Kir and also shares some common regulators with Kir channels. Tenidap is a class of anti-inflammatory drugs that was found to be a potential opener of the Kir channel and the modulator for other ion channels. It is unknown whether Tenidap could modulate both Kir and the K+ leak channel. In the present work, we tested the effect of tenidap on Kir and the leak current with whole-cell patch-clamp recording in acute brain slices in mice. We found that tenidap actually inhibited the Kir current but enhanced the leak current in MSNs in the striatum. SKF83822, a dopaminergic D1 receptor agonist, could increase the Kir current but did not affect the leak channels. In addition, it could increase Kir-mediated membrane resonant frequencies in MSNs. However, tenidap decreased the resonant frequency of MSNs, which also supported that tenidap did inhibit Kir in striatal MSNs in mice. Our results demonstrated that tenidap oppositely regulates the Kir and leak currents, which also suggested that K+ leak channels should be taken into account when investigating the role of drugs that have multiple downstream targets, such as tenidap. These results suggested that tenidap may be used to differentiate the role of the Kir and leak channels in striatal-related functions and to provide a potential tool for interventions in striatal-related diseases. As the main input nuclei of the basal ganglia, the striatum is not only critical for motor control and learning [1,2] but also involves in psychiatric disorders, such as autism and obsessive-compulsive disorder [3,4]. There are evidences sugest that the imbalance between the direct and indirect pathways of the striatum might play a causative role in such as autism, Parkinson disease and Huntington’s disease [5- 7]. The inwardly rectifying K+ (Kir) channel participates in the regulation of balance between the direct and indirect pathways via excitability modulation and dendritic integration [6-8]. We have also shown that Kir is the channel mechanism responsible for fine tuning the beta resonance of the direct and indirect pathway activities of the striatum . These suggested that Kir may be one of the key targets in the regulation of striatal-related function. Therefore, it is important for systematic research to be conducted on the channel modulator of Kir for future potential pharmacological therapies. Tenidap is a class of drug that shows some of the pharmacological properties of both nonsteroidal anti-inflammatory drugs and secondline agents for rheumatoid arthritis. One study found that tenidap could open the one of Kir family, hKir2.3 . It also has been shown to inhibit the activities of other ion channels, such as calcium channels in mast cell lines and nonselective cation channels in cells of the bloodbrain barrier [11,12]. It suggested that Tenidap may modulate several ion channels in the different brain reagion or in the same area. In the striatum, both Kir channels and leak channels are involved in the highly negative resting potential [13,14]. And Kir and leak channels share some common regulators and participate in the excitability modulation of neurons [15-17]. It remains unclear whether Tenidap regulates both Kir channels and leak channels in the striatum. In the present research, we tested the effect of tenidap on Kir channels in striatal medium-sized spiny neurons (MSNs) in acute brain slices from mice. The results showed that tenidap actually inhibited Kir but enhanced leak currents in the MSNs, which might be contradictory to previous reports. SKF83822 (dopaminergic D1 receptor agonist) could increase the Kir current but did not affect the leak channels. These two chemicals produced opposite effects on the membrane resonance since they have reverse modulatory effects on Kir channels. Our results suggested that tenidap has multiple downstream targets, such as the ion channels of striatal MSNs, which might produce complicated effects on neuronal electrical properties. The findings might help us to differentiate the role of Kir and “leak channels” in striatal-related functions and to provide a potential tool for interventions in striatal-related diseases. Four male, four female C57BL/6J and two Drd1a-tdTomato transgenic female mice (5-6 weeks of age) were used for the whole experiment. The generation of Drd1a-tdTomato transgenic (D1-Td) mice was described previously . Mice were housed under a 12 h light/dark cycle in a temperature-controlled environment with ad libitum food and water. The D1-Td mice were the progeny of breeding in which only one of the parents expressed the D1-Td. All animal care was performed in accordance with the “Principles of Medical Laboratory Animal Care” issued by the National Ministry of Health. All experiments conformed to the guidelines of the “National Ordinances on Experimental Animals” for the ethical use of animals. The mice were deeply anaesthetized with pentobarbital sodium (30–40 mg/kg) and were rapidly decapitated. The brains were rapidly removed and submerged quickly in ice-cold, oxygenated (95% O2, 5% CO2) cutting solution comprising the following (in mM): 115 cholinechloride, 2.5 KCl, 1.25 NaH2PO4, 0.5 CaCl2, 8 MgCl2, 26 NaHCO3, 10 D-(+)-glucose, 0.1 L-Ascorbic Acid, and 0.4 sodium pyruvate (with osmolarity of 300-305 mOsm /l). Coronal slices that were 300μm-thick and that included the striatum were prepared in ice-cold, oxygenated cutting solution and were then incubated with oxygenated cutting solution for 20 min at 32 °C. Then, the slices were transferred to the incubation chamber with oxygenated artificial cerebrospinal fluid (ACSF) containing the following (in mM): 119 NaCl, 2.3 KCl, 1.0 NaH2PO4, 26 NaHCO3, 11 D-(+)-glucose, 1.3 MgSO4, and 2.5 CaCl2 (pH 7.4, with osmolarity of 295–300 mOsm) at room temperature for 1-2 hours before recording. The MSNs were identified by their oval shape, their 10-12 µm diameter cell bodies and their typical delayed firing property under a current clamp. For the slices from the D1-td mice, individual fluorescent-positive MSNs were also visualized and selected with a microscope equipped with an RFP filter (BX- 51 WI, Olympus, Japan). The recording pipette resistance was typically 3–5 MΩ when filled with an internal solution consisting of the following (in mM): 128 potassium gluconate, 10 Hepes, 10 phosphocreatine sodium salt, 1.1 EGTA, 5 ATP magnesium salt, and 0.4 GTP sodium salt. The pH level was 7.3, and the osmolarity was approximately 300 – 305 mOsm/l. Cells were selected for further analysis after meeting the following conditions: (1) resting membrane potentials more negative than – 60 mV and (2) action potentials with overshooting. Liquid junction potentials were not corrected. The recording was performed with an Axon 200B amplifier (Molecular Devices, USA). Signals were low-pass filtered at 5 kHz and sampled at 20 kHz with a Digidata 1322A and a Clampex 8.0 (Molecular Devices). A voltage step from -60 mV to -65 mV was applied for off-line leak subtraction. ▪ Analysis of electrical resonanceResonance was manifested as a distinct and reproducible peak in the voltage response at a specific frequency. The impedance amplitude profile (ZAP) method was used to characterize the resonance behaviour of the cells . The ZAP current waveform was a swept sine-wave current with a constant amplitude and a linearly increasing frequency (0–200 Hz for 10 s). The ZAP current was injected through the pipette to record the voltage response when the neuron was held at -100 mV. Fast Fourier transform (FFT) of both the membrane potential response and the ZAP current was performed to measure the resonance frequency and resonance resistance. All chemicals for the ACSF, cutting solution and internal solution were purchased from Sigma. All drugs were purchased from Tocris. All drugs were made as concentrated stock solutions (1000 x) with DMSO or H2O. All stocks of drugs were diluted in ACSF to their final concentrations on the day of the experiment and were delivered via constant perfusion to the recording chamber. The resonance data were imported to the Origin 8.0 software (OriginLab Corporation, USA) for FFT. Then, all data were transferred to Prism 6.0 (GraphPad Software, Inc, USA) for analysis and graphing. Data are presented as the mean ± SEM, and the n value given for each experiment refers to the number of cells analysed. All error bars indicate SEM. The results of two groups were compared using a two-tailed paired t-test. We first tested whether tenidap could enhance Kir currents in MSNs. Whole-cell patch clamp recordings were performed in the dorsal striatum (Figures 1 A-C). As shown in Figure 1D, The neuron showed a long delay in initial spiking, which is characteristic of the MSN intrinsic properties . A hyperpolarized step from -60 mV to -110 mV was performed to induce the inwardly rectifying current. Another hyperpolarized voltage step from -60 mV to -65 mV, which was followed by the first one, was used to measure the leak current (Figure 1E). The current induced by the first hyperpolarized step consisted of two components: the inward current and the leak current. An offline leak subtraction was performed to eliminate the component of the leak current based on the second hyperpolarized step from -60 mV to -65 mV using the Clampfit software (Figure 1F). We found that the currents were blocked by 0.5 mM BaCl2, which suggested that the current was an inwardly rectifying potassium current . The current remaining with 0.5 mM BaCl2 could be removed by offline leak subtraction, which suggested that it was mediated by membrane resistance or the “leak channels” (Figure 1F). Next, we examined whether tenidap modulates the Kir current. As shown in Figures 1 G and I, the Kir amplitude seemed to increase compared to that in the control ACSF via application of 10 μM tenidap (Kir Current Density: Control, 5.7 ±0.85 pA/pF; Tenidap, 7.1 ± 1.11 pA/pF; n = 11 neurons, 4 mice, two-tailed paired t-test t=4.548, df=10, p = 0.0011). However, the increase may have been produced by the leak current. Indeed, after offline leak subtraction, we found that the amplitude of the Kir current was significantly reduced by tenidap compared with that of the control (Kir Current Density: Controls, 3.3 ±0.52 pA/pF; Tenidaps, 2.6 ± 0.48 pA/pF; n = 11 neurons, 4 mice, two-tailed paired t-test, t=6.741, df=10, p < 0.0001, Figure1H and J). These results suggested that tenidap may	actually reduce the Kir current if the portion of the leak current was excluded. Figure 1: Tenidap reduced the Kir current in the MSNs. A-B. The electrode was placed at the edge of the dorsal striatum; C. An MSN was recorded from with a 40x DIC view; D. The same cell recorded in C showed a delay in initial spiking; E. The Kir current was induced by a hyperpolarized step from -60 mV to -110 mV. The second hyperpolarized step from -60 mV to -65 mV was applied to measure the leak current; F. The same trace in E was used to perform leak subtraction. Controls: the control trace with leak subtraction. Ba2+ s: the trace recorded during Ba2+ bathing with leak subtraction; G. The Kir current was blocked totally by 0.5 mM Ba2+ after offline leak subtraction. G. Tenidap increased the amplitude of the Kir current before offline leak subtraction. The black dot marks the measurement point of the Kir amplitude; H. Tenidap actually decreased the amplitude of the Kir current after offline leak subtraction; I. Without offline leak subtraction, the amplitude of the Kir current was increased by tenidap (Kir Current Density: Control, 5.7 ± 0.85 pA/pF; Tenidap, 7.1 ± 1.11 pA/pF; n=11 neurons, 4 mice, two-tailed paired t-test t=4.548, df=10, p=0.0011); J. With offline leak subtraction, the amplitude of the Kir current was decreased by tenidap (Kir Current Density: Controls, 3.3 ± 0.52 pA/pF; Tenidaps, 2.6 ± 0.48 pA/pF; n=11 neurons, 4 mice, two-tailed paired t-test, t=6.741, df=10, p<0.0001). * indicates p<0.05, ** indicates p<0.01 and **** indicates p<0.0001 in this and other figures. Since tenidap increased the whole current induced by the hyperpolarized voltage step, while reducing the pure Kir current, we suspected that the increase in the whole current mediated by tenidap might directly affect the leak current. We examined the current induced by the second hyperpolarized voltage step from -60 mV to -65 mV, which should have contained the leak current only. 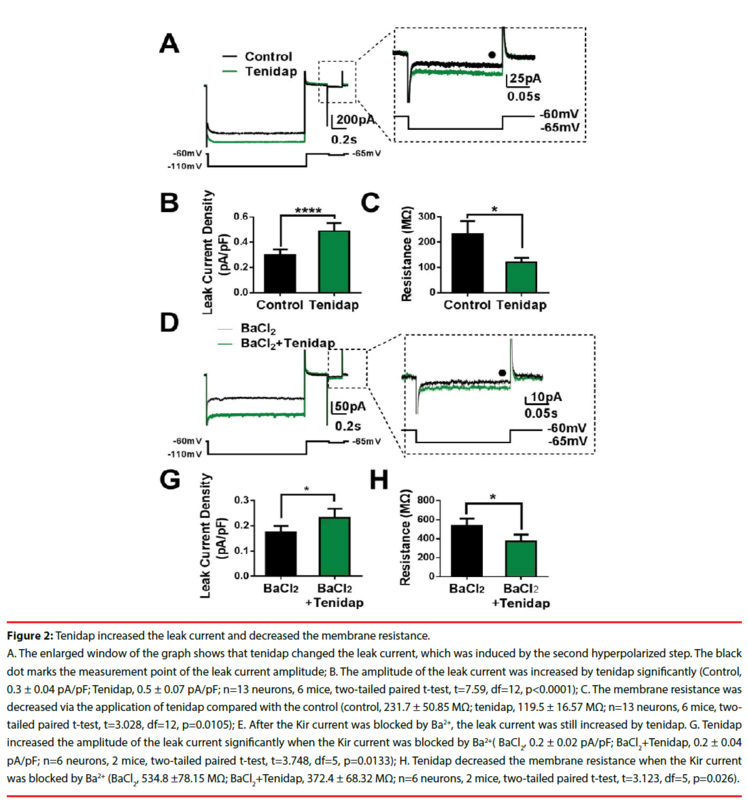 As shown in the enlarged window of Figure 2A, the application of tenidap increased the leak current significantly compared with that of the control (Control, 0.3 ± 0.04 pA/ pF; Tenidap, 0.5 ±0.07 pA/pF; n = 13 neurons, 6 mice, two-tailed paired t-test, t=7.59, df=12, p < 0.0001, Figure 2B). 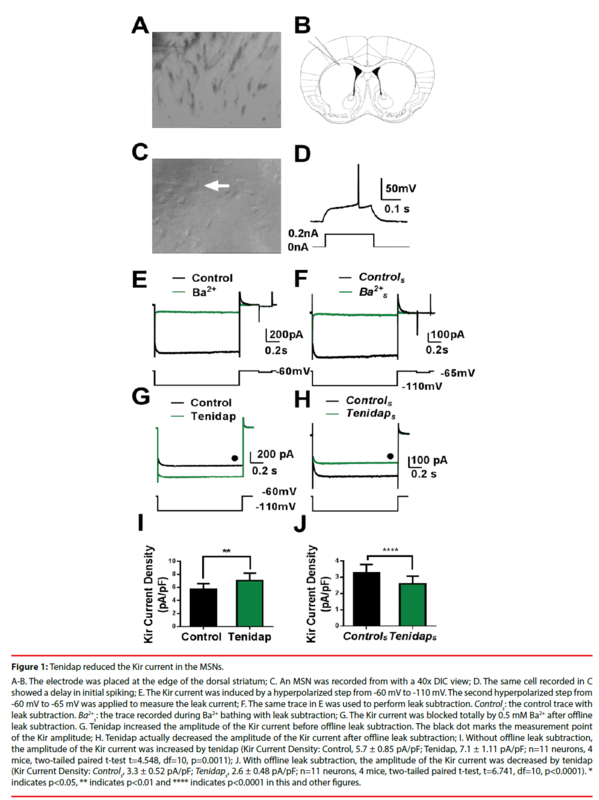 In addition, tenidap reduced the membrane resistance (control, 231.7 ± 50.85 MΩ; tenidap, 119.5 ± 16.57 MΩ; n = 13 neurons, 6 mice, two-tailed paired t-test, t=3.028, df=12, p = 0.0105 Figure 2C). To confirm that tenidap did indeed have a direct effect on the leak current, we next tested the leak current with tenidap bath after we blocked the Kir current using 0.5 mM Ba2+ since the leak current is relatively insensitive to Ba2+ . As we expected, the step current was increased even when the Kir current was blocked by Ba2+ (Figure 2D). The statistical results showed that the leak current in response to tenidap and Ba2+ co-perfusion was significant larger than that in response to Ba2+-only perfusion (BaCl2, 0.2 ± 0.02 pA/pF; BaCl2+Tenidap, 0.2 ± 0.04 pA/ pF; n = 6 neurons, 2 mice, two-tailed paired t-test, t=3.748, df=5, p = 0.0133, Figure2G). Meanwhile, the membrane resistance was also decreased significantly in response to the tenidap and Ba2+ co-bathing (BaCl2, 534.8 ±78.15 MΩ; BaCl2+Tenidap, 372.4 ± 68.32 MΩ; n = 6 neurons, 2 mice, two-tailed paired t-test, t=3.123, df=5, p = 0.026, Figure 2H). These results demonstrated that tenidap actually increased the whole inward current induced via hyperpolarization stimulation by increasing the leak current but not the Kir current. Figure 2: Tenidap increased the leak current and decreased the membrane resistance. A. The enlarged window of the graph shows that tenidap changed the leak current, which was induced by the second hyperpolarized step. The black dot marks the measurement point of the leak current amplitude; B. The amplitude of the leak current was increased by tenidap significantly (Control, 0.3 ± 0.04 pA/pF; Tenidap, 0.5 ± 0.07 pA/pF; n=13 neurons, 6 mice, two-tailed paired t-test, t=7.59, df=12, p<0.0001); C. The membrane resistance was decreased via the application of tenidap compared with the control (control, 231.7 ± 50.85 MΩ; tenidap, 119.5 ± 16.57 MΩ; n=13 neurons, 6 mice, twotailed paired t-test, t=3.028, df=12, p=0.0105); E. After the Kir current was blocked by Ba2+, the leak current was still increased by tenidap. G. Tenidap increased the amplitude of the leak current significantly when the Kir current was blocked by Ba2+( BaCl2, 0.2 ± 0.02 pA/pF; BaCl2+Tenidap, 0.2 ± 0.04 pA/pF; n=6 neurons, 2 mice, two-tailed paired t-test, t=3.748, df=5, p=0.0133); H. Tenidap decreased the membrane resistance when the Kir current was blocked by Ba2+ (BaCl2, 534.8 ±78.15 MΩ; BaCl2+Tenidap, 372.4 ± 68.32 MΩ; n=6 neurons, 2 mice, two-tailed paired t-test, t=3.123, df=5, p=0.026). Our recent work found that 6-chloro-2,3,4,5 -tetrahydro-1-(3-methylphenyl)-3-(2-propenyl)- 1H-3- benzazepine (SKF83822, 2 μM, D1 receptors agonist) increased the amplitude of the Kir current in D1 MSNs regardless of the presence or absence of leak subtraction . Therefore, we wondered whether SKF83822 also affects membrane resistance. We selected D1-Td positive cells (Figures 3A and B) and examined the amplitude of the leak current in response to SKF83822 bathing. There were no differences in the leak current amplitudes or membrane resistances between the control and the SKF83822 neurons (leak current density: Control, 0.5 ± 0.08 pA/pF; SKF83822, 0.5 ± 0.08 pA/pF; n = 5 neurons, 3 mice, two-tailed paired t-test, t=0.4205, df=4,p = 0.70. membrane resistance: control, 107.6 ± 15.79 MΩ; SKF83822, 111.4 ± 14.58 MΩ; n = 5 neurons, 3 mice, two-tailed paired t-test, t=0.278, df=4, p = 0.79, Figures 3 C-E). These results showed that SKF83822 increased the amplitude of the Kir current without affecting the leak current, which means that the Kir current and the leak current could be regulated separately. Figure 3: A D1 receptor agonist increased the Kir current without affecting the membrane resistance. A-B. A D1 MSN was recorded from with a 40x DIC and fluorescent view; C. The amplitude of the Kir current was increased by SKF83822 (2 μM, D1 receptor agonist). The enlarged window in the second hyperpolarized step shows that SKF83822 did not affect the leak current. The black dot marks the measurement point of the leak current amplitude; D. There was no difference between the control ACSF and the SKF83822 in terms of the amplitude of the leak current (leak current density: Control, 0.5 ± 0.08 pA/pF; SKF83822, 0.5 ± 0.08 pA/pF; n=5 neurons, 3 mice, two-tailed paired t-test, t=0.4205, df=4, p=0.70); E. There was no significant difference between the control ACSF and the SKF83822 in terms of membrane resistance (control, 107.6 ± 15.79 MΩ; SKF83822, 111.4 ± 14.58 MΩ; n=5 neurons, 3 mice, two-tailed paired t-test, t=0.278, df=4, p=0.79). We found that the MSNs exhibited beta frequency membrane resonances mediated by the Kir current in our recent work . In addition, the resonant frequency increased, and the maximum impedance decreased when the Kir current was increased in response to SKF83822 (Figures 4 A-B, . Therefore, we tested how tenidap modulates the Kir-mediated membrane resonance. As shown in Figures 4C-D, the resonant frequency reduced significantly after incubation with tenidap in the MSNs, which was opposite to the modulation by SKF83822 (control, 12.7 ± 1.08 Hz; tenidap, 8.5 ± 0.51 Hz; n = 5, two-tailed paired t-test, t=3.391, df=4,p = 0.03, Figure 4E). The maximum impedance was increased by tenidap at same time, although we did not find any significant differences between the control and the neurons treated with tenidap (control, 26.0 ± 2.86 MΩ; tenidap, 29.4 ± 3.28 MΩ; n = 5, two-tailed paired t-test, t=0.9709, df=4,p = 0.39. Figure 4F). These results suggested that tenidap might reduce the Kir current, but it does not increase this current in striatal MSNs. 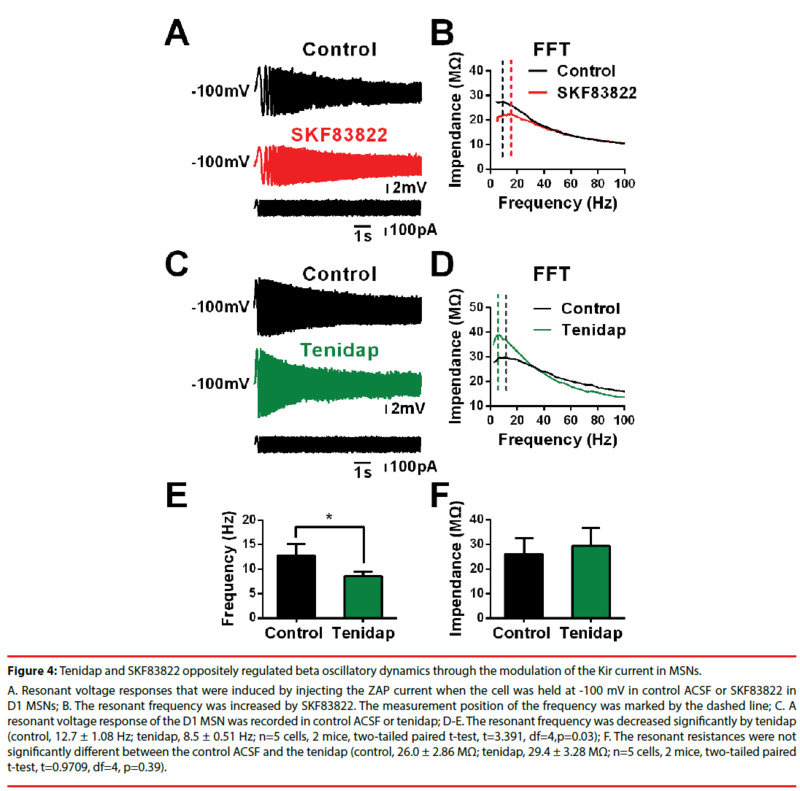 Figure 4: Tenidap and SKF83822 oppositely regulated beta oscillatory dynamics through the modulation of the Kir current in MSNs. A. Resonant voltage responses that were induced by injecting the ZAP current when the cell was held at -100 mV in control ACSF or SKF83822 in D1 MSNs; B. The resonant frequency was increased by SKF83822. The measurement position of the frequency was marked by the dashed line; C. A resonant voltage response of the D1 MSN was recorded in control ACSF or tenidap; D-E. The resonant frequency was decreased significantly by tenidap (control, 12.7 ± 1.08 Hz; tenidap, 8.5 ± 0.51 Hz; n=5 cells, 2 mice, two-tailed paired t-test, t=3.391, df=4,p=0.03); F. The resonant resistances were not significantly different between the control ACSF and the tenidap (control, 26.0 ± 2.86 MΩ; tenidap, 29.4 ± 3.28 MΩ; n=5 cells, 2 mice, two-tailed paired t-test, t=0.9709, df=4, p=0.39). In the present work we found that tenidap increased the leak current and decreased the Kir current in striatal MSNs. This finding was contradictory to those of previous reports. 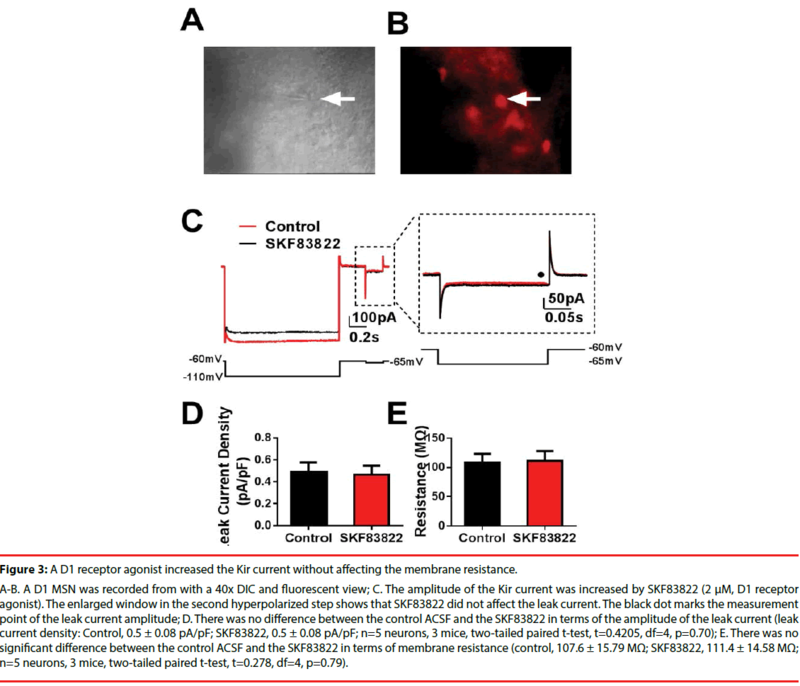 To further confirm this finding, we compared the effect of tenidap on the Kir current in response to SKF83822 (dopaminergic D1 receptor agonist) which increased the Kir current but did not affect the leak channels. These two chemicals produced opposite effects on the membrane resonance. This finding demonstrated that tenidap did oppositely regulate the Kir and leak currents in striatal MSNs, which suggested that the leak current should be taken into account during the investigation of drugs having multiple downstream targets, such as tenidap. Kir channels are classified into the Kir1.x to Kir7.x subfamilies and have been labelled as inward rectifiers . The Kir subunit contains two transmembrane regions, and the functional Kir channels are made up of four such subunits in a tetrameric complex. They are insensitive to membrane voltage and depend more on the electrochemical gradient of K+. In the striatum, Kir channels have been detected by various methods and is involved in dendritic integration and in hyperpolarized resting membrane potentials in the striatum [6,13]. As another ion channel responsible for the resting potentials, TREK1 (TWIK-related K+ channels) is the main source of the leak conductance in the striatum . It is made up of four transmembrane segments and two pore-forming domains that are arranged in tandem. These two channels not only partially overlap in function but are also regulated by common chemicals. For example, both Kir2.3 and TREK1 were found to be increased by arachidonic acid [15,16]. The activation of G protein-coupled receptors can also modulate both channels. Liu found that tenidap is an opener of hKir2.3 channels in Chinese hamster ovarian cells . We also observed an increase in the Kir current induced by tenidap if we did not perform leak subtraction. However, the increase occurred with leak current enhancement, meaning that the effect might be induced by leak conductance but not by Kir conductance (Figures 2A-B). Ba2+ is a relative blocker of Kir but cannot block leak current meidated by TREK1 [22,21]. We found that the remaining current in response to Ba2+ bathing indeed increased after Ba2+ and tenidap co-perfusion, which suggested that tenidap enhanced the leak conductance. Liu also reported an increase in leak conductance induced by tenidap . However, the question remained of the true effect of tenidap on the Kir current. One of the important differences between our study and that of Liu was that we always performed leak subtraction on the same recording trace (Figures 1E-F), but Liu performed leak subtraction with 3 mM Ba2+. This may have resulted in a misleading of the true effect of tenidap on the Kir current since the leak conductance modulation by tenidap might have been washed out in response to 3 mM Ba2+. To further support our finding, we also measured the membrane resonance of the MSNs in the striatum. Membrane resonance is the ability of neurons to respond selectively to inputs at a preferred frequency, which is one of the cellular mechanisms of neural oscillation [26-28]. The previous results found that the resonant conductance determined the resonant frequency . In addition, we showed that the Kir current is the resonant conductance of the membrane resonance in striatal MSNs. When the Kir current was increased by the dopamine D1 receptor agonist, we did see the resonant frequency increase as well (Figures 4A-B). However, we found that the resonant frequency of the MSNs decreased in response to tenidap bathing, which provided further evidence supporting that tenidap did inhibit the Kir current but did not enhance it in the striatal MSNs of mice. One group reported that tenidap showed opposing effects on volume-regulated anion channel and K(ATP) channel activity in rat pancreatic beta-cells . This finding might be indirect evidence that supports our finding that tenidap could inhibit the Kir current and enhance leak conductance at the same time. Therefore, we should be very careful when we try to study the role of chemicals on one of these two channels, especially since the leak conductance is always accompanied by other active currents. In addition, now researchers have suggested that K+ leak channels may be more than background channels and may respond to a wide range of physiological and pathological inputs, such as pain, ischaemia, epilepsy and depression. It is important to separate and monitor the leak current when we try to record any active current. Although there is a lack of specific chemical tools that target Kir and leak channels, our results may still remind us to pay close attention to the leak conductance when we study the role of chemicals on any active conductance, such as that of the Kir current. In addition to this, our results also suggested that tenidap may be used as a chemical for differentiating the role of the Kir channels and “leak channels” in striatal-related functions and may provide a potential tool for interventions in striatal-related diseases. This work was supported by the Natural Science Foundation of China (grant number: 81771476 to W. T. W., and No. 81471342 to J.L. Z.) and Shaanxi Key Research and Development Program (grant number: 2017SF-137 to W.T.W.) We thank Dr. Guoping Feng for sharing the Drd1a- Tdtomato transgenic mice. We thank American Journal Experts (AJE) for English language editing (certificate verification key: B56C-B37C-494D- 2A79-584C). Grant Number: 81771476 and Shaanxi Key Research and Development Program (grant number: 2017SF-137 to W.T.W.) to W. T. W., and No. 81471342 to J.L. Z.
Yin H, Knowlton B. The role of the basal ganglia in habit formation. Nat. Rev. Neurosci 7(6), 464-476 (2006). Balleine BW, Delgado MR, Hikosaka O. The role of the dorsal striatum in reward and decision-making. J. Neurosci 27(31), 8161-8165 (2007). Welch J, Lu J, Rodriguiz R, et al. Cortico-striatal synaptic defects and OCD-like behaviours in Sapap3-mutant mice. Nature 448(7156), 894-900 (2007). Peça, J, Feliciano C, Ting, J, et al. Shank3 mutant mice display autistic-like behaviours and striatal dysfunction. Nature 472(7344), 437-442 (2011). Wang W, Li C, Chen Q, et al. Striatopallidal dysfunction underlies repetitive behavior in Shank3-deficient model of autism. J. Clin. Invest 127(5), 1978-1990 (2017). Shen W, Tian X, Day M, et al. Cholinergic modulation of Kir2 channels selectively elevates dendritic excitability in striatopallidal neurons. Nat. Neurosci 10(11), 1458-1466 (2007). Ariano MA, Cepeda C, Calvert CR, et al.. Striatal potassium channel dysfunction in Huntington's disease transgenic mice. J. Neurophysiol 93(5), 2565-2574 (2005). Falk T, Xie,JY, Zhang S, et al. et al. Over-expression of the potassium channel Kir2.3 using the dopamine-1 receptor promoter selectively inhibits striatal neurons. Neuroscience 155(1), 114-127 (2008). Zhao B, Zhu J, Dai D, et al. Differential dopaminergic regulation of inwardly rectifying potassium channel mediated subthreshold dynamics in striatal medium spiny neurons. Neuropharmacology 107(1), 396-410 (2016). Liu Y, Printzenhoff D, Coghlan MJ, et al. Tenidap, a novel anti-inflammatory agent, is an opener of the inwardly rectifying K+ channel hKir2.3. European. Journal. of. Pharmacology 435(2-3), 153-160 (2002a). Cleveland PL, Millard PJ, Showell HJ, et al. Tenidap: a novel inhibitor of calcium influx in a mast cell line. Cell. Calcium 14(1), 1-16 (1993). Popp R, Englert HC, Lang HJ, et al. Inhibitors of nonselective cation channels in cells of the blood-brain barrier. Exs 66(1), 213-218 (1993). Nisenbaum ES, Wilson CJ. Potassium currents responsible for inward and outward rectification in rat neostriatal spiny projection neurons. J. Neurosci 15(6), 4449-4463 (1995). Honore E. The neuronal background K2P channels: focus on TREK1. Nat. Rev. Neurosci 8(4), 251-261 (2007). Lee AK, Smart JL, Rubinstein M, et al. Reciprocal regulation of TREK-1 channels by arachidonic acid and CRH in mouse corticotropes. Endocrinology 152(5), 1901-1910 (2011). Liu Y, Liu D, Krafte DS. Decrease of inward rectification as a mechanism for arachidonic acid-induced potentiation of hKir2.3. European. Biophysics. Journal 31(7), 497-503 (2002b). Day M, Carr DB, Ulrich S, et al. Dendritic excitability of mouse frontal cortex pyramidal neurons is shaped by the interaction among HCN, Kir2, and Kleak channels. J. Neurosci. Sep 25(38), 8776-8787 (2005). Shuen JA, Chen M, Gloss B, et al. Drd1a-tdTomato BAC transgenic mice for simultaneous visualization of medium spiny neurons in the direct and indirect pathways of the basal ganglia. J. Neurosci 28(11), 2681-2685 (2008). Wang WT, Wan YH, Zhu JL, et al. Theta-frequency membrane resonance and its ionic mechanisms in rat subicular pyramidal neurons. Neuroscience 140(1), 45-55 (2006). Kita T, Kita H, Kitai ST. Passive electrical membrane properties of rat neostriatal neurons in an in vitro slice preparation. Brain. Res 300(1), 129-139 (1984). Lesage F. Pharmacology of neuronal background potassium channels. Neuropharmacology 44(1), 1-7 (2003). Zhao B, Dai DQ, Xing JL, et al. Differential Dopaminergic Regulation of Inwardly Rectifying Potassium Channel Mediated Subthreshold Dynamics in Striatal Medium Spiny Neurons. Neuropharmcology1003-1037 (2016). Hibino H, Inanobe A, Furutani K, et al. Inwardly rectifying potassium channels: their structure, function, and physiological roles. Physiol Rev 90(1), 291-366 (2010). Pruss H, Derst C, Lommel R, et al. Differential distribution of individual subunits of strongly inwardly rectifying potassium channels (Kir2 family) in rat brain. Brain. Res. Mol. Brain. Res Sep 139(1), 63-79 (2005). Hervieu GJ, Cluderay JE, Gray CW, et al. Distribution and expression of TREK-1, a two-pore-domain potassium channel, in the adult rat CNS. Neuroscience103(4), 899-919 (2001). Mathie A. Neuronal two-pore-domain potassium channels and their regulation by G protein-coupled receptors. J Physiol Jan 578(Pt 2), 377-385 (2007). Hutcheon B, YaromY. Resonance, oscillation and the intrinsic frequency preferences of neurons. Trends. Neurosci 23(5), 216-222 (2000). Shtrahman E, Zochowski M. Pattern segmentation with activity dependent natural frequency shift and sub-threshold resonance. Sci. Rep 5(1), 8851 (2015). Tohidi V, Nadim F. Membrane resonance in bursting pacemaker neurons of an oscillatory network is correlated with network frequency. J. Neurosci 29(20), 6427-6435 (2009). Best L, Brown PD, Sener A, et al. Opposing effects of tenidap on the volume-regulated anion channel and K(ATP) channel activity in rat pancreatic beta-cells. European. Journal. Of. pharmacology Mar 629(1-3), 159-163 (2010).